An on-chip, high extinction ratio transverse electric (TE)-pass polarizer using a silicon hybrid plasmonic grating is proposed and experimentally demonstrated. Utilizing plasmonics to manipulate the effective index and mode distribution, the transverse magnetic mode is reflected and absorbed, while the TE mode passes through with relatively low propagation loss. For a 6-μm-long device, the measurement result shows that the extinction ratio in the wavelength range of 1.52 to 1.58 μm varies from 24 to 33.7 dB and the insertion loss is 2.8–4.9 dB. Moreover, the structure exhibits large alignment tolerance and is compatible with silicon-on-insulator fabrication technology. Q. Deng, Q. Yan, L. Liu, X. Li, J. Michel, and Z. Zhou, “Robust polarization-insensitive strip-slot waveguide mode converter based on symmetric multimode interference,” Opt. Express 24, 7347–7355 (2016). L. Liu, Q. Deng, and Z. Zhou, “Subwavelength-grating-assisted broadband polarization-independent directional coupler,” Opt. Lett. 41, 1648–1651 (2016). T. Barwicz, M. R. Watts, M. A. Popović, P. T. Rakich, L. Socci, F. X. Kärtner, E. P. Ippen, and H. I. Smith, “Polarization-transparent microphotonic devices in the strong confinement limit,” Nat. Photonics 1, 57–60 (2007). B. Bai, Q. Deng, and Z. Zhou, “Plasmonic-assisted polarization beam splitter based on bent directional coupling,” IEEE Photon. Technol. Lett. 29, 599–602 (2017). L. Gao, F. Hu, X. Wang, L. Tang, and Z. Zhou, “Ultracompact and silicon-on-insulator-compatible polarization splitter based on asymmetric plasmonic-dielectric coupling,” Appl. Phys. B 113, 199–203 (2013). L. Liu, Q. Deng, and Z. Zhou, “Manipulation of beat length and wavelength dependence of a polarization beam splitter using a subwavelength grating,” Opt. Lett. 41, 5126–5129 (2016). L. Gao, Y. Huo, J. S. Harris, and Z. Zhou, “Ultra-compact and low-loss polarization rotator based on asymmetric hybrid plasmonic waveguide,” IEEE Photon. Technol. Lett. 25, 2081–2084 (2013). L. Gao, Y. Huo, K. Zang, S. Paik, Y. Chen, J. S. Harris, and Z. Zhou, “On-chip plasmonic waveguide optical waveplate,” Sci. Rep. 5, 15794 (2015). B. Bai, L. Liu, and Z. Zhou, “Ultracompact, high extinction ratio polarization beam splitter-rotator based on hybrid plasmonic-dielectric directional coupling,” Opt. Lett. 42, 4752–4755 (2017). S. I. H. Azzam, M. F. O. Hameed, N. F. F. Areed, M. M. Abd-Elrazzak, H. A. El-Mikaty, and S. S. A. Obayya, “Proposal of an ultracompact CMOS-compatible TE-/TM-pass polarizer based on SOI platform,” IEEE Photon. Technol. Lett. 26, 1633–1636 (2014). D. Dai, Z. Wang, N. Julian, and J. E. Bowers, “Compact broadband polarizer based on shallowly-etched silicon-on-insulator ridge optical waveguides,” Opt. Express 18, 27404–27415 (2010). X. Guan, P. Chen, S. Chen, P. Xu, Y. Shi, and D. Dai, “Low-loss ultracompact transverse-magnetic-pass polarizer with a silicon subwavelength grating waveguide,” Opt. Lett. 39, 4514–4517 (2014). Y. Xiong, D. X. Xu, J. H. Schmid, P. Cheben, and W. N. Ye, “High extinction ratio and broadband silicon TE-pass polarizer using subwavelength grating index engineering,” IEEE Photon. J. 7, 7802107 (2015). S. I. Azzam and S. S. A. Obayya, “Ultra-compact resonant tunneling-based TE-pass and TM-pass polarizers for SOI platform,” Opt. Lett. 40, 1061–1064 (2015). H. Xu and Y. Shi, “On-chip silicon TE-pass polarizer based on asymmetrical directional couplers,” IEEE Photon. Technol. Lett. 29, 861–864 (2017). D. K. Gramotnev and S. I. Bozhevolnyi, “Plasmonics beyond the diffraction limit,” Nat. 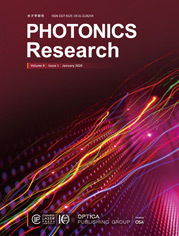 Photonics 4, 83–91 (2010). Z. Ying, G. Wang, X. Zhang, Y. Huang, H. Ho, and Y. Zhang, “Ultracompact TE-pass polarizer based on a hybrid plasmonic waveguide,” IEEE Photon. Technol. Lett. 27, 201–204 (2015). T. K. Ng, M. Z. M. Khan, A. Al-Jabr, and B. S. Ooi, “Analysis of CMOS compatible Cu-based TM-pass optical polarizer,” IEEE Photon. Technol. Lett. 24, 724–726 (2012). Y. Huang, S. Zhu, H. Zhang, T. Liow, and G. Lo, “CMOS compatible horizontal nanoplasmonic slot waveguides TE-pass polarizer on silicon-on-insulator platform,” Opt. Express 21, 12790–12796 (2013). B. Ni and J. Xiao, “Plasmonic-assisted TE-pass polarizer for silicon-based slot waveguides,” IEEE Photon. Technol. Lett. 30, 463–466 (2018). B. Ni and J. Xiao, “A compact silicon-based TE-pass polarizer using three-guide directional couplers,” IEEE Photon. Technol. Lett. 29, 1631–1634 (2017). X. Sun, M. Mojahedi, and J. S. Aitchison, “Hybrid plasmonic waveguide-based ultra-low insertion loss transverse electric-pass polarizer,” Opt. Lett. 41, 4020–4023 (2016). Y. Xu and J. Xiao, “A compact TE-pass polarizer for silicon-based slot waveguides,” IEEE Photon. Technol. Lett. 27, 2071–2074 (2015). M. Z. Alam, J. S. Aitchison, and M. Mojahedi, “Compact and silicon-on-insulator-compatible hybrid plasmonic TE-pass polarizer,” Opt. Lett. 37, 55–57 (2012). X. Sun, M. Z. Alam, S. J. Wagner, J. S. Aitchison, and M. Mojahedi, “Experimental demonstration of a hybrid plasmonic transverse electric pass polarizer for a silicon-on-insulator platform,” Opt. Lett. 37, 4814–4816 (2012). M. Alam, J. S. Aitchison, and M. Mojahedi, “Compact hybrid TM-pass polarizer for silicon-on-insulator platform,” Appl. Opt. 50, 2294–2298 (2011). B. Bai, L. Liu, R. Chen, and Z. Zhou, “Low loss, compact TM-pass polarizer based on hybrid plasmonic grating,” IEEE Photon. Technol. Lett. 29, 607–610 (2017). B. Bai, X. Li, and Z. Zhou, “Fabrication tolerant TE-pass polarizer based on hybrid plasmonic Bragg grating,” in 13th IEEE International Conference on Group IV Photonics (GFP) (IEEE, 2016), paper ThP26. X. Guan, P. Xu, Y. Shi, and D. Dai, “Ultra-compact broadband TM-pass polarizer using a silicon hybrid plasmonic waveguide grating,” in Asia Communications and Photonics Conference (Optical Society of America, 2013), paper ATh4A.2. X. Gaun, P. Xu, Y. Shi, and D. Dai, “Ultra-compact and ultra-broadband TE-pass polarizer with a silicon hybrid plasmonic waveguide,” Proc. SPIE 8988, 89880U (2014). J. Buus, M. Amann, D. J. Blumenthal, and M. Amann, Tunable Laser Diodes and Related Optical Sources (Wiley, 2005). D. I. Yakubovsky, A. V. Arsenin, Y. V. Stebunov, D. Y. Fedyanin, and V. S. Volkov, “Optical constants and structural properties of thin gold films,” Opt. Express 25, 25574–25587 (2017). W. S. Cleveland, “Robust locally weighted regression and smoothing scatterplots,” J. Am. Stat. Assoc. 74, 829–836 (1979). Fig. 1. 3D schematic of the proposed TE-pass polarizer on an SOI platform. Fig. 2. (a) Real part of neff and (b) absolute value of the real part Δneff in the HPW and DW for TM and TE polarizations as a function of waveguide width W. Here, the gap between the metal strip and the Si waveguide below is g=50 nm. Fig. 3. (a) Mode similarity (between the hybrid plasmonic mode in the HPW and the photonic mode in the DW) and (b) the absolute value of the real part Δneff in the HPW and DW for TM and TE polarizations as a function of insertion layer thickness g. Here, waveguide width W is 450 nm. Fig. 4. (a) ER and (b) IL as a function of metal strip length d with period variation from 730 to 760 nm. Here, N=8, W=450 nm, and g=50 nm. Fig. 5. Optical energy flux density along the propagation direction from the top view when the TM or TE mode is injected. Here, W=450 nm, N=8, d=400 nm, and Λ=750 nm. Fig. 6. SEM image of the fabricated TE-pass polarizer. Fig. 7. (a) Normalized measured spectrum of one polarizer. (b) Corresponding ER and IL of the device. The black lines are trend lines extracted with robust locally weighted regression.